la diaspora africaine en Suisse : quelles dynamiques ? Quel rôle pour le Programme de développement 2030 de l’ONU ? Quelques soient les sources, la notion de diaspora tourne toujours autour des mêmes éléments, à savoir l’ensemble des membres d’un peuple dispersés à travers le monde mais restant en relation. Certains élargissent ce groupe également aux descendants des migrants. La notion de mémoire collective ou de culture du pays d’origine est un autre aspect important de cette définition. Si on l’applique au contexte africain, et selon les critères de l’Union africaine, il s’agit des « personnes d’origine africaine vivant hors du continent africain, qui sont désireuses de contribuer à son développement et à la construction de l’Union africaine, quelles que soient leur citoyenneté et leur nationalité ». C’est ce lien spécifique entre la personne établit à l’étranger et son pays d’origine qui rend la diaspora comme un élément déterminant pour le développement (durable) du continent. De par son importance à travers le monde, la diaspora africaine joue un rôle primordial pour nombre de pays du continent, notamment à travers ses apports financiers, matériels et humains. C’est dans cette optique, que la diaspora africaine est devenue un acteur de premier plan dans la mise en œuvre à la fois de l’Agenda 2030 de développement durable de l’ONU, mais aussi pour l’Agenda 2063 de l’Union africaine. L’étude des flux migratoires ne peut se faire sans lien avec le phénomène de mondialisation. Cette dernière n’est pas sans incidence dans les dynamiques migratoires à l’échelle internationale tant dans ses causes que ses formes. Elle rend ainsi ce phénomène difficile à appréhender. Necessity is the mother of invention, and in Africa it has been the mother of innovation. While the continent is vastly different, the level of innovation has been interesting to watch, largely fuelled by the equalizing nature of technology and mobile telephony. Over the last 15 years, African economies have enjoyed growth above the global average. This has largely been fuelled by mineral agriculture, with growth linked to China’s demand for raw materials. While this demand from China is now slowing down, the rise of African countries is a new story. It is estimated that in 2016, the African population will reach 1,069 billion people, the majority of whom are under 30. Africa has the highest rates of urbanisation; its poor infrastructure, which has previously hampered growth and development, is now a catalyst for innovation. The mobile phone in Africa has become a game-changer for the continent. According to Ericsson, the technology company, by 2019 there will be 930 million mobile phones in Africa, almost one for every person on the continent. 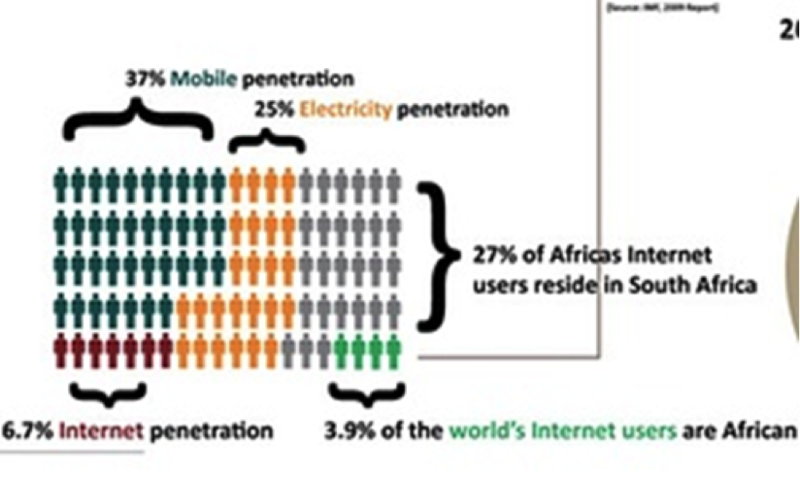 There is greater mobile penetration than electricity penetration. Now, people are able to connect, get news, trade, get access to healthcare and even transfer money. One of the biggest innovations to come out of Africa is mobile money transfer, which has disrupted traditional financial models. The technology behind it has now been exported to the West. The continent is starting to see the rise of e-healthcare solutions and online education solutions, two of the biggest challenges on the continent. For the first time, we are seeing a trend of being technology generators rather than just adopters, and we are seeing more innovators from the west move to the continent due to an easier, and in some cases non-existent, regulatory environment, which enables greater experimentation in the market with few competitors. These include new drone technology for the delivery of goods to leapfrog the infrastructure divide. Overall, there seems to be good news for the continent, as Africa looks to technology to catalyse new areas of growth, a good example being East Africa, with Rwanda and Kenya in particular championing the need for an enabling environment. Cape Town-based social impact incubator RLabs has opened applications for the 2016 cycle of its Innovation, Incubation and Accelerator (InnovIA) Programme, aimed at turning innovative ideas into scalable social enterprises. Founded by Marlon Parker in 2008, RLabs is a global movement and registered social enterprise that provides innovative solutions to address various complex problems. Its core activities are skills and training, community development, social and disruptive innovation, mobile and internet solutions, social enterprise incubation, impact investing and social franchising. Disrupt Africa reported in November the incubator showcased 10 new startups that graduated from the InnovIA programme, bringing the total number of innovations it has produced in four years to 47. “The RLabs InnovIA programme, now in its fifth year offers an exciting and invaluable opportunity for innovators and social entrepreneurs to grow and build their enterprises. This 12-week programme is designed to assist participants during their startup’s most vulnerable period, and support taking an idea or product to market,” RLabs said. Aspirant social innovators and entrepreneurs are invited to apply online, with applicants to be subjected to a selection process. If successful, they will be expected to commit themselves or one team member to the programme. For the most part, wealthy countries like the U.S. and Germany have been the ones to adopt home solar panels. Home owners typically buy their solar systems out right or lease them from a third party like SolarCity SCTY -2.29% . These solar systems tend to plug into the broader power grid. Small and medium-sized enterprises (SME’s) are the primary job creation engine in Africa, accounting for over 95% of firms and 60%-70% of employment. Yet, SME’s on the continent report access to finance as the biggest obstacle to growth. Malaik, an impact-focused equity crowdfunding portal, test launched today, to connect investors interested in impact investment opportunities and entrepreneurs raising equity finance. Malaik offers the global community clear and well-documented opportunities for high impact investing in African businesses, a chance to participate in Africa’s growth story. Malaik is targetted at sophisticated investors, who understand the risks of investing in start ups. The platform uses a unique system of first identifying a lead investor before putting a company on the platform. The lead investor sets the terms and valuations of the deal, and personally invests a minimum of 25% of the companies’ asking round. The lead investor negotiates a fair valuation and is required to conduct their own due diligence before putting their money in. A lead investor may be an individual investing alone, or a representative for an investing group or institution. The crowd receives the same class of share, and the same price per share, as the lead investor, except indicated otherwise. Companies listed on Malaik decide how much money they want to raise in exchange for a certain percentage of equity, and each investor’s equity interest is proportionate to the size of their investment. Malaik will focus on high-impact companies that provide jobs and solve social and infrastructural issues in African nations while maintaining profitability. The global portal will fund seed stage businesses requiring funding between $200,000 to $2,000,000. Malaik has identified local partners in key regions around Africa that will source for high impact start ups locally, entrepreneurs can also apply to be listed on www.malaik.com. According to the Search for Returns survey, 80 percent of the investors expect African private equity to outperform African listed equity over the coming decade. CEO of SAVCA, Erika van der Merwe, explains how the asset class presents a healthy opportunity for investors looking to Africa for private equity. In the context of a global search for returns, investors eager to obtain exposure to frontier markets in Africa – one of the world’s fastest-growing consumer markets – are increasingly exploring the sub-Saharan African private equity market. Erika van der Merwe, CEO of the Southern African Venture Capital and Private Equity Association (SAVCA), says that, as private equity is still under-represented in sub-Saharan Africa, the asset class presents an opportunity for investors to invest in a region that is experiencing strong economic growth and which is generating robust returns. According to the Search for Returns survey, 80 percent of the investors expect African private equity to outperform African listed equity over the coming decade. Van der Merwe adds that the South African private equity industry in particular has delivered healthy returns for investors. She believes that the industry, which has a thirty-year track record of deal-making, exits and fundraising, and which now has an expanding regional reach, is set to play an important role in the continued growth of the asset class in other African markets. The latest RisCura-SAVCA South African Private Equity Performance Report shows that, by mid-year 2015, the South African private equity industry delivered a ten-year internal rate of return (IRR) of 21.7 percent, up from 20.5 percent in March 2015. This performance compares with the 17.1 percent return from the FTSE/JSE All Share Total Return Index (ALSI) over the equivalent 10-year period. Botswana is a small country with a population of 2 million. The country located in the sub-Saharan Africa, is well known for its Kalahari desert which occupies 70% of the landmass and its mineral wealth in diamond. Almost all of Botswana’s US$14.79 billion GDP is made up from the mineral extraction industries, with over 50% coming from diamond export revenues in the mineral sector, followed by livestock trading and others. The country is ranked 149 among 188 global economies in the World Bank’s ranking for competitiveness for doing business, which measures the ease of starting and run successful enterprise in Botswana. Some of the most noteworthy challenges experienced by SMEs are inadequate marketing skills, business premises and other start-up business problems. This is according to A 2002 research paper “Government Policy and Entrepreneurship Performance“ by the Department of Accounting and Finance at the University of Botswana. In a 2012 editorial by the Sunday Standard, editor Outsa Mokone said ”[Botswana's] regulatory framework is not only outdated but also excessive, intrusive, tedious and outright unfriendly”, and that It takes two full months to register and start operating a business in Botswana. The country has an unemployment rate of only 18%, which is marginally better than its SADEC neighbors of South Africa where it is at 25%, Namibia at 29%, or Zimbabwe which is unknown. Writing in the Washington Post in November 2014, the Head of Stanbic Bank in Botswana, Onkabetsi Morapedi said there was a noticeable growth, particularly in the last five years, and an increasing number of SMEs in the country. “More opportunities have arisen in time, largely in the form of tenders or purchase orders,” Morapedi wrote. And an overview of the country by the World Bank released in April 2014 shows that Botswana has rapidly grown into becoming one of the fastest growing economies and moved into the ranks of upper-middle income countries from being one of the poorest countries in Africa since independence from Britain in 1996.